Alana and George are such a great couple, and probably have the most memorable "how did you meet" story i've heard throughout my years of shooting weddings here in Pittsburgh! Who knew a little fender bender of sorts could turn into a loving relationship and eventually their wedding day? I knew right then when I heard that story that they were going to be so much fun, down to earth, and definitely put on a killer wedding! Their main focus was to be surrounded by their close friends and family. Their wedding style was very chic and elegant with some wonderful DIY details. Their colors featured a deep wine red with peach accents with beautiful florals by Blumengartens styling each space. 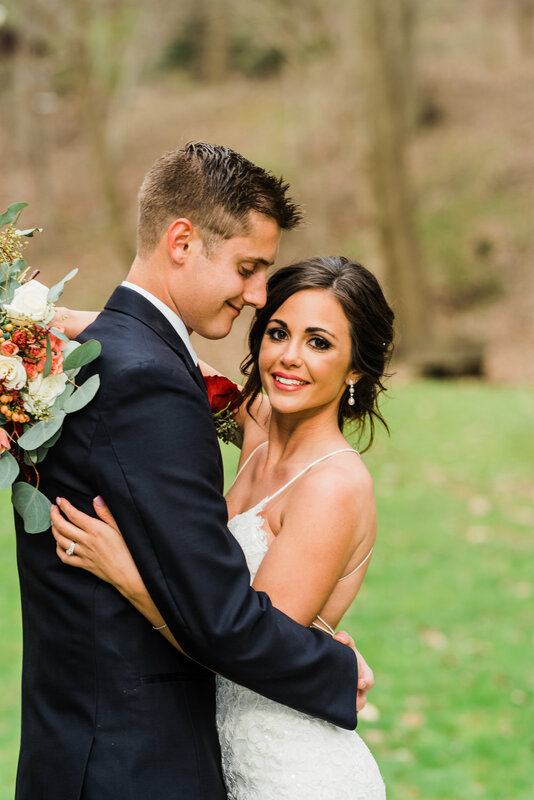 Alana's gown from Sorelle Bridal Salon featured a long skirt she wore with her bridal gown, which she look stunning in before and during their traditional Greek ceremony. Alana's brother had the honor of Koumbaro as he switched crowns and their rings. Alana's father also built the wooden pallet backdrop of their sweetheart table which I absolutely loved! Signature desserts and family + friends filled the cookie table with tons of delicious cookies and treats! They also surrounded themselves with wonderful vendors we were happy to work with.